Many of the reviews of this machine contain old or incorrect information. There is a WAV converion tool at this point, and you can burn CD's that will play on any CDR compatiable player right out of sonicstage. I have done this, and I have recorded live music and burned CD's, and recorded Cassette tapes, and burned CD's. It's all there on Sonicstage 2.3. 1. You can do all the things mentioned above. 2. Huge amount of space on a disc. I recorded old radio programs onto a HI-MD disc at 48bps, and got the claimed 45 hours (or close to it) on the one little disc. No good for music (at that rate-music sounds great at 132 bps and above), but great for voice. 3. The machine has a mic input for live recordings. Sounds pretty good at higher sample rates. 4. The machine can be used as a data drive like a memory stick. Just don't fire up Sonicstage and go to MY COMPUTER. Very easy to use. 5. The Sony Music store is OK, and I enjoyed the five free downloads. 1. The build quality seems not that great (this is where the machine loses the star). The little metal clasp that "snaps" the two parts together seems very light (but I notice this same clasp is on a MD I have used for two years with no problems). 2. The disks are hard to get (but that is changing), and a little expensive (but not bad for the capacity). 3. Doesn't make me want an ipod any less. Do not buy this product, unless losing tracks is your goal! 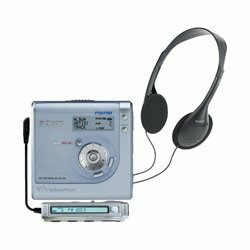 Do not buy this product, unless losing tracks is your goal.At first, we were very happy with this mini-disc, as the sound quality (if you buy the Sony mic) is impressive. However, when we downloaded the files (which we spent a month live recording) to the software included with the device, they were not able to be burned to a CD, and they were unable to be transferred back to the mini-disc.This came after extensive researching on the Sony web site, downloading the additional upgrade and WAV converter, etc. etc. I spent an hour on the phone with Sony support, at which time they told me to re-transfer the files, which not only was bad advice because it did not transfer again, but it then erased all of the original tracks on the mini-disc. After spending 2 hours on the phone with Sony support, they had no solutions, told us our files were in "limbo" and told us we may not be able to use these tracks and that they would have to call us back.While we waited, we came up with our own backup idea, which would lose sound quality but at least save our files.Sony then called us and recommended the same idea, only they recommended we buy an additional backup disc.We bought two.Good thing we backed it up TWICE, because not only did the software delete the first disc of music, but it also erased part of the backup disc due to an error message that came up from the Sony software (not a computer error, but a SONY SOFTWARE ERROR).Sony support gives you an event number when you call, and they are very courteous, but one event number is not going to cover all of the problems that we encountered with this software.Also, if you call after hours, they ask you ten minutes worth of your personal information and THEN tell you that they are closed and you are not given the option to leave a message. There is no telling when the software is going to fail, and we had to take a gamble with our last disc.Experimentation with tracks is unthinkable, as we were constantly in fear of losing material.We tried to get through the transfer process as fast as possible, for fear of another error message intruding and erasing tracks. We finally got the software to agree with the idea of burning a CD, only to transfer them to the CD in random order (not the order we transferred them).After throwing that CD away, we re-organized the files on the screen, and burned another CD.We had carefully purchased Sony Cds, since we wanted the quality to be top notch.We found that the ONLY Cds that did not come out with a clear recording quality were actually the Sony Cds. We tried three Cds just to make sure it wasn't one bad CD.Maxell and Philips actually worked much better with the Sony software-- they were flawless. Sony had static throughout the entire CD.All were the same download!Another complaint is that the instructions regarding burning a CD from live audio are not complete.They lead you to the point of transfer from mini-disc to hard drive, and then you are responsible for finding out the remainder of the process (converting files and burning to a CD). Obviously, Sony has now upgraded their product to allow for CD burning, so they should include some information with their product which tells you to upgrade and to use the WAV conversion tool BEFORE you transfer the files to the software included with the product. Why can't Sony make this compatible with Media Player, for example? Why does it have to be Sony software? Their software obviously needs to be researched further before more people lose valuable recordings.There is no safeguard against lost files. 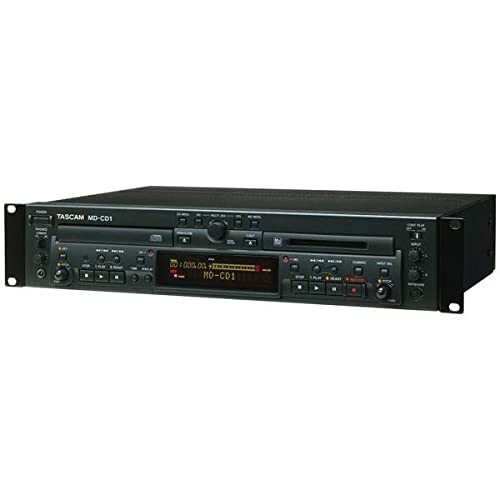 I would recommend buying a DAT recorder or another alternative if you are serious about recording live music.If you decide to purchase this product, I recommend first upgrading to SonicStage 2.3, downloading WAV converter tool (available on Sony web site), and then pray.I at least hope this advice will save you the 30+ hours we spent just at the computer, plus the additional finances that we incurred (cables and discs) just to back something up that should not have needed to be backed up. I'm happy with the 800 except for the lack of a backlight on the main unit or on the remote.Many descriptions of the unit on the www (including the one here at amazon) indicate that the remote is backlit.Not!The 900, which is $50 more has a backlight but has a very dorky battery arrangement: you have to use a proprietary Sony NiMH battery, and if you want to get the claimed 30 hours operating time, you also have to attach the screw-on AA battery adapter.This is a really stupid design on the 900, IMHO.The 800 just uses a single AA, which can be a rechargeable NiMH.The 900 also doesn't have a radio.I'm not sure why anyone would buy the 900.. I also bought the ECM-DS70P stereo mic, which attaches directly to the unit's mic mini-jack without a wire.Very Cool.You can monitor the recorded sound through the headphones. 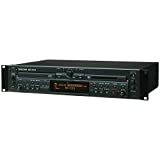 If you hope you can upload music you recorded before, you will be disappointed.You only can upload music recorded with this player.Another problem is that you can not record FM program even though the player comes with a FM tuner. First of all, I want to preface this review by noting that I am not a major techie or very much into the whole music downloading file sharing thing. I originally purchased this minidisc unit so I could make recordings of the talks I give and be able to transfer them to my computer. I never thought I'd use it for anything else. When the product arrived, I was intitally skeptical. It is small (which is great), but accordingly, the buttons are also tiny, and the lettering is so small as to be virtually impossible for my over-40 eyes to read.I feared that this would be more complex than I bargained for.Not to worry. The product manual was clear, and operation of the unit is actually pretty easy. It is so simple to transfer cd's onto the minidisc player, and the sound is fantastic!In addition to the self-recording I had bought this player for, I now find myself constantly bringing it to the gym for my workouts and on trips so I can bring my favorite music with me. It turns out I really love this toy!As far as the problem that a few reviewers mentioned about converting to WAV format for uploads, Sony has now released a free WAV conversion program available on its web site, and there are other conversion options out there as well. Control-S input for supplied wired/wireless remote. Analog and digital record level. Balanced XLR & Unbalanced RCA analog I/O, coaxial and optical digital I/O.